iRealHousewives | The 411 On American + International Real Housewives: Lisa Vanderpump Is Reportedly ‘Obligated’ To Film At Least One More Scene Of RHOBH Upcoming Ninth Season! Lisa Vanderpump Is Reportedly ‘Obligated’ To Film At Least One More Scene Of RHOBH Upcoming Ninth Season! 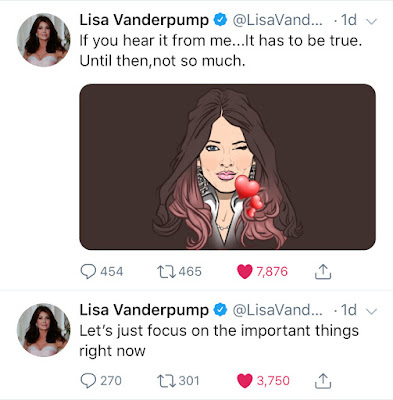 According to a new report, Lisa Vanderpump has to shoot one more scene for the upcoming ninth season of The Real Housewives of Beverly Hills and apparently, she is not looking forward to it. “Lisa is undecided as to her future right now even though her team has been telling people that she plans to quit Housewives after this season,” a source told Hollywood Life. However, LVP recently opened up about her future on the show amid reports claiming she’ll be exiting after Season 9 of the Bravo hit series due to her feud with other cast members. “But it has been a difficult season... But it's been a difficult year for me personally, and the season was very challenging. So I'm in a lot of it, but there are some parts I skip, and I think people have seen that,” she added.